Back before smartphones came along and made our lives easier, when we hit the open road we had to—hahahahaha—print out directions. Sometimes, if you can believe it, we used physical maps made of paper. 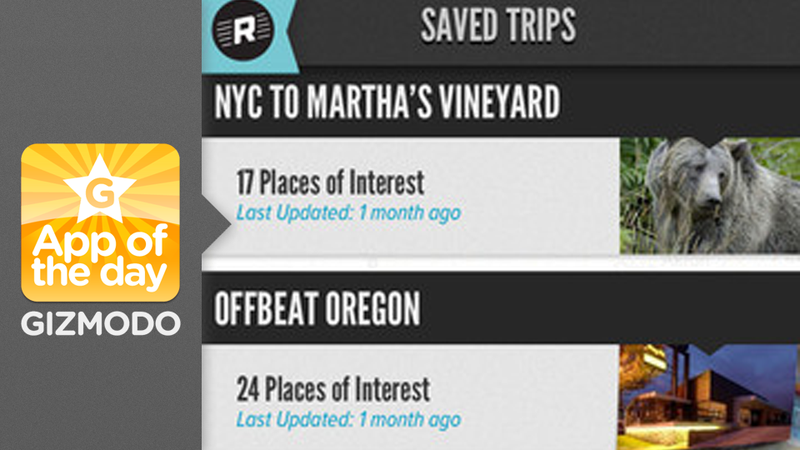 Now that epic road trip you take is even easier to plan and execute with Roadtripper's iPhone app. Lets you plan a route and plots out your destinations. It will tip you off to points of interest on the road and even gives turn-by-turn directions so you never have to stop at some sketchy gas station and ask where you are. Roadtrippers the app is a companion to the awesome website of the same name; the two work together. Any plans you make on the website will automatically sync with the app, so it's pretty seamless in terms of planning. Didn't make it to a certain stop this time around? Save it to a bucket list and check it out next time. And everything is completely independent—so you're not going to get flooded by chains like McDonald's, even if it happens to be the largest McDonald's in North America. And beyond business listings, it identifies spots like movie filming locations. Have at it, road warriors.